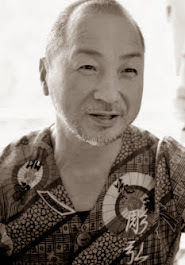 Horihiro is a tattoo artist from Kansai, the Western region of Japan who uses the traditional Japanese technique of inking by hand. He has inked thousands of people with his needlework. 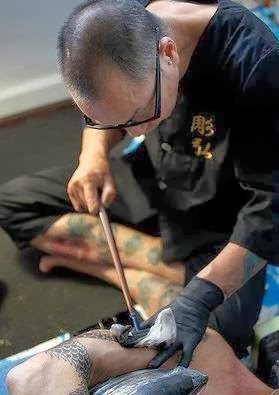 Among the Yakuza (Japanese mafia), he is known as the “number one tattooist in Osaka”. He is an artist who has devoted himself to this technique for 30 years, since becoming an apprentice of what is said to be the oldest group of tattooists in Osaka, the Horimitsu. The main characteristic of Horihiro’s hand-inked tattoos is the beauty in the shading of their indigo blue. He creates spectacular shading only by the tones of a Sumi ink that he makes himself, and by changing the pressure of tattoo needle. You instinctively want to touch the portion of skin where he has applied the ink as the skin gains a detailed texture and becomes a deep glossy indigo blue. Another thing Horihiro can be proud of is that his tattoos don’t fade for 10 or even 20 years. It can be assured that over time the tattoo will become a part of your body and your skin, unlike tattoos that fade over a number of years. Designs of animals with scales, such as dragons and carp make best use of this technique. The shading of each scale is delicately applied and this subtle colour can be done only by hand, not machine. Horihiro’s work is quick and precise. The work is not too painful and causes little bleeding, even compared to machine tattooing. Of course experience differs person to person, but generally the work heals quickly and scabs rarely occur. In other words, it’s gentle, and damage on the skin is very minor. This is why the tattoo will look just as fantastic after a few months, and when it's settled and it becomes a part of your skin.